Cpge de Settat, Lycee Qualifiant Technique PB: 576-Maroc. In this paper, we propose a new approach to nonstandard analysis without using the ultrafilters. This method is very simple in practice. Moreover, we construct explicitly the total order relation in the new field of the infinitesimal numbers. To illustrate the importance of this work, we suggest comparing a few applications of this approach with the former methods. F. Bagarello, Nonstandard variational calculus with applications to classical mechanics. I. An existence criterion, Internat. J. Theoret. Phys., 38 (1999), pp. 1569-1592. F. Bagarello, Nonstandard variational calculus with applications to classical mechanics. II. The inverse problem and more, Internat. J. Theoret. Phys., 38 (1999), pp. 1593-1615. F. Bagarello and S. Valenti, Nonstandard analysis in classical physics and quantum formal scattering, Int. J. Theor. Phys., 27 (1988), pp. 557-566. V. Benci and M. Di Nasso, Alpha-theory: an elementary axiomatics for nonstandard analysis, Expo. Math., 21 (2003), pp. 355-386. 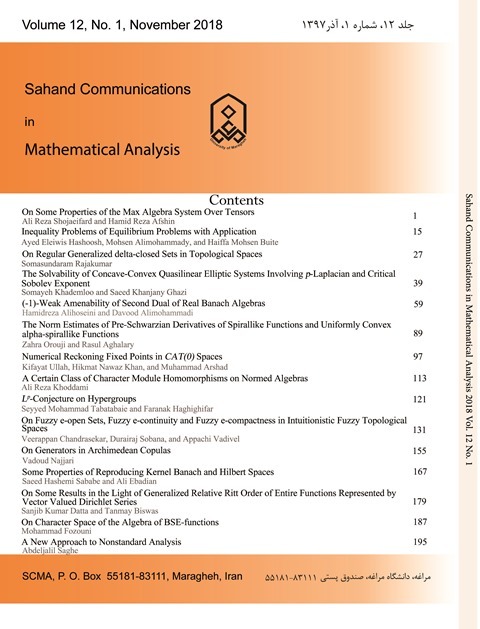 V. Benci, M. Di Nasso, and M. Forti, The eightfold path to nonstandard analysis, Nonstandard Methods and Applications in Mathematics, 25 (2006), pp. 3-44. J.M. Borwein, D.M. Bradley, and R.E. Crandall, Computational strategies for the Riemann zeta function, J. Comput. Appl. Math., 121 (2000), pp. 247-296. N. Cutland, Nonstandard Analysis and its Applications, Cambridge University Press, Cambridge, 1988. F. Diener and G. Reeb, Analyse non standard, Hermann, 1989. R. Fittler, Asymptotic nonstandard quantum electrodynamics, J. Math. Phys., 34 (1993), pp. 1692-1724. P. Fletcher, K. Hrbacek, V. Kanovei, M. Katz, C. Lobry, and S. Sanders, Approaches to analysis with infinitesimals following Robinson, Nelson, and others, Real Analysis Exchange, 42 (2017), pp. 193-252. R. Goldblatt, Lectures on the Hyperreals: An Introduction to Nonstandard Analysis, Springer, Graduate Texts in Mathematics 188, 1998. A. Granville, Harald Cramer and the distribution of prime numbers, Scand. Actuar. J., 1 (1995), pp. 12-28. E. Nelson, Internal Set Theory: a new approach to Nonstandard Analysis, Bull. A.M.S., 83 (1977), pp. 1165-1198. A. Robinson, Non-standard Analysis, North-Holland, Amsterdam, 1966. W. Rudin, Analyse reelle et complexe, Masson, 1978. P. Tauvel, Cours dalgebre: agregation de mathematiques, Dunod, 1999.